Club Penguin Cheats by Mimo777 Club Penguin Cheats by Mimo777: G Made A "Rookie" Mistake! Gary has sent us a Club Penguin message about the Hydra-bot! For real, G? How could you make such a "Rookie" mistake? How do you think he could do this? Music Jam Rocks!I hope Herbert will not attack us during the party. I cant wait for music jam . im acter boy 1 on cp but how could Gary make a mistake like that ? i thought rookie was the one for being silly . Mabey G isn't really on our side, i mean we have been fighting herbert for a long time and G has always had gadgets to stop him! Nothing seems to be unexpected, and G has always been there, he has always had an imediate solution. Anyone agree with me? You made a mistake. Your name is Rookie, not G, OK? And why did he use calculations to figure out whose fault was it? D: G will get fired! Hey, I don't know what u mean. 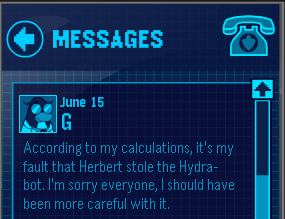 If G has something to stop Herbert all the time, isn't that good! If G was ailies with Herbert, then why would G be defeating him? I think we should wach out 4 the Director. Don't you think it's weird how he dosn't let us see him! Have any of you read Great Puffle Switch? Maybe that happened to G! Just kiddin' G! We all make mistakes! When Does Music Jam Start? I know a certain green penguin with a propeller cap whose name begins with R who would make a similar mistake. The party is on right now! Start dancin' and partyin' and searchin' for your favorite characters!